The Orange County Register reported this Wednesday on an overturned vehicle at the Orange Crush, where the Santa Ana, Garden Grove, and Orange Freeways (I-5, SR-22, and SR-57) all come together at one of the most complex freeway interchanges in the world. Details on the driver or what caused the vehicle to overturn have not been released. California Highway Patrol did, however, report that an injury resulted from the accident, and traffic was blocked up for over half an hour while the accident was cleared from the road. Don’t drive distracted. Always keep your eyes on the road and hands on the wheel, especially when approaching complicated freeway interchanges. Reduce your speed. Follow the posted speed limit, and slow down when approaching difficult entrance and exit ramps. Don’t drive while exhausted. Make sure you’re well rested, and avoid taking medication that can make you drowsy before you have to get in the car. Call a cab, ask for a ride from a friend or coworker, or take a short nap until you’re ready to go. Use your turn signals. Signal before you turn, merge, or change lanes, and make sure that you signal early enough that other drivers have time to see them. 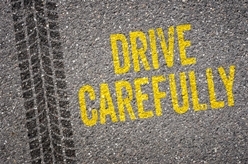 Be courteous on the road. Treat other drivers the way that you’d like to be treated. LA-area traffic can be monumentally frustrating at times, but overly aggressive driving is a leading cause of traffic accidents. If you are ever hurt in an auto accident, you may be able to receive compensation for your injuries. Don’t let the insurance company tell you otherwise until you’ve talked to an attorney that’s got experience with auto accident and personal injury claims. You can learn how to protect your legal right to fair compensation by reading our free book, 7 Biggest Mistakes That Can Ruin Your California Injury Case. If you have any questions and would like to speak with one of our knowledgeable personal injury attorneys, we’re here to help you, day or night. Call us for a free case evaluation at 800-989-6385.